Designed exclusively for DISH programming, the Pathway X1 is the smallest automatic portable satellite TV antenna on the market. This ultra sleek, compact antenna not only looks great, it searches and locks onto the satellite faster than other antennas so you can start enjoying your programming in just minutes. Unique to the Pathway X1, is its ability to convert to a permanent roof mount antenna for stationary use. Roof mount kit is sold separately. Equipped to work with 2 receivers, set-up is effortless with a customized DISH receiver interface. (Some user interaction is required when changing channels with the two-receiver set up.) Ideal for DISH Pay as you go programming or compatible with any current DISH subscription. Supports DISH HD/SD programming. No power cord necessary, antenna is powered through DISH ViP 211 series receiver. Includes easy grip handle and 25 coaxial cable. 13.5"H x 14.3"Dia. Made in USA. Convert your portable antenna into a permanent roof mount unit with this simple to install roof kit accessory. Remove portable feet and antenna dome; line up roof feet and fasten into placel replace dome antenna and mount on roof. 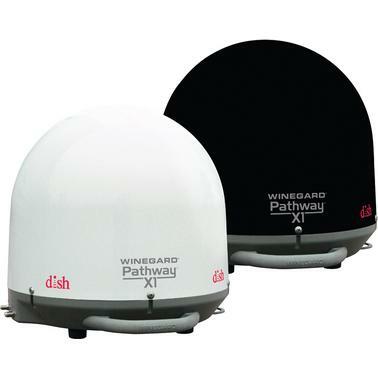 Bundle Includes Pathway X1, Dish ViP 211z receiver, Handle and 25' coax cable.